This is a scalable context timeline. 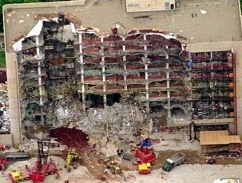 It contains events related to the event June 27, 1996: Ex-Sister-in-Law Cooperated with Government Investigation into Oklahoma City Bombing, Defense Lawyers Reveal. You can narrow or broaden the context of this timeline by adjusting the zoom level. The lower the scale, the more relevant the items on average will be, while the higher the scale, the less relevant the items, on average, will be. Denies Knowledge of Bombing - Nichols denies any foreknowledge of McVeigh’s bombing, saying merely that McVeigh had told him “something big” was in the offing (see April 15, 1995). He tells his questioners that the first he heard of the bombing was while watching a television demonstration at the Home Cable Television sales outlet in Herington. The agents ask him when he last had contact with McVeigh. According to Nichols, he sent McVeigh a letter in February 1995, asking McVeigh if the next time he was in Las Vegas, he could pick up an old television set from his ex-wife Lana Padilla; Nichols says he wanted the television set for when his son Joshua visited. Tells of Long Easter Trip to Oklahoma City, Junction City for Television - On the afternoon of Easter Sunday, April 16, Nichols says, McVeigh called and asked him to come to Oklahoma City to pick up the television set (see April 16-17, 1995). “I’m pressed for time to get back east” to his family in New York, Nichols says McVeigh told him. “If you want your television, you’ll have to come to Oklahoma City.” Although Oklahoma City is some 250 miles away, Nichols agreed to make the trip. He also agreed to tell his wife that he was going to Omaha, not Oklahoma City, at McVeigh’s request. Nichols explains: “He [McVeigh] has a private nature. He has told me that no one is to know his business. Some of the things he wanted kept private were trivial matters. He just doesn’t want people to know what he is doing. That is just his nature.” Nichols tells the agents that before Easter, he had last heard from McVeigh in November 1994 or perhaps early 1995 (see February 20, 1995 and April 11, 1995). He then says: “In my eyes, I did not do anything wrong but I can see how lawyers can turn stuff around. I did not know anything. Lawyers can turn stuff around.” He denies ever seeing McVeigh at any motel in Junction City, Kansas (see September 22, 1994, January 19 - January 27, 1995, and (February 20, 1995)), says he has no knowledge of McVeigh renting a Ryder truck (see April 15, 1995, April 16-17, 1995, Late Evening, April 17, 1995, 5:00 a.m. April 18, 1995, and 8:15 a.m. and After, April 18, 1995), and was never asked by McVeigh to buy any materials related to making bombs (see September 13, 1994, September 22, 1994, September 30, 1994, October 3, 1994, October 4 - Late October, 1994, October 17, 1994, October 18, 1994, October 20, 1994, October 21 or 22, 1994, October 29-30, 1994, November 5, 1994, November 5, 1994 - Early January 1995, November 7, 1994, November 9, 1994, January 19 - January 27, 1995, January 31 - February 12, 1995, February 20, 1995, March 1995, March 17, 1995, April 5-10, 1995, April 15-16, 1995, 5:00 a.m. April 18, 1995, 8:00 a.m. April 18, 1995, and 8:15 a.m. and After, April 18, 1995). He says he drove to Oklahoma City and picked up McVeigh near the Murrah Federal Building (see April 16-17, 1995). McVeigh loaded the television into the pickup, Nichols says, along with a green duffel bag. They then headed towards Junction City. Nichols says he met McVeigh in an alleyway and never saw McVeigh’s car, which he says McVeigh claimed was broken down. Asked what they talked about, Nichols responds, “McVeigh talked in code.” He only later understood what his friend meant when he said “something big” was going to happen; he claims that he thought McVeigh was talking about robbing a bank. The conversation then turned to the Branch Davidian tragedy (see April 19, 1993 and April 19, 1993 and After), and McVeigh said he was interested in a protest rally for April 19 in Washington, DC. Nichols says he does not know why McVeigh wanted to go to Junction City. Maybe McVeigh had another car there, Nichols speculates. He let McVeigh off in Junction City, ate by himself at a Denny’s restaurant, and made the short drive home. Morning's Events - Nichols says he spoke to his ex-wife Lana Padilla earlier that day, angering his wife Marife, who announced she wanted to go back to the Philippines. “I’ve got friends there,” he says she told him. “I don’t have friends here. You got friends like Tim.” Marife does not like McVeigh, Nichols says, complaining that he lives his life “on the edge” and drives too fast. As for his conversation with Padilla, Nichols says she asked him about $3,000 he had apparently given her for their son Joshua. Investigators will later speculate that the money came from a robbery Nichols perpetrated in order to fund the bombing (see November 5, 1994). He says he went to a local lumberyard, then came back home. Wife Questioned for Six Hours - Marife Nichols is questioned for six hours (see 3:15 p.m. and After, April 21, 1995). Warrants Signed - Oklahoma City’s chief federal judge, David L. Russell, is at the FBI’s command center, and after the decision is made in Washington to procure a material witness arrest warrant, Russell signs it. It is faxed to the police station in Herington at 4:46 p.m. FBI agents interrogating Nichols do not tell him that the material witness warrant is now available; lead agent Thomas A. Price will later say he did not want to interrupt the interrogation. Russell will say he is not aware that Nichols is being interviewed by the FBI, and, noting language on the warrant that says Nichols “has attempted to leave the jurisdiction of the United States,” will say that the language is “inconsistent” with Nichols’s voluntary presentation at the police station.